How prevalent are viruses (e.g., Epstein-Barr virus [EBV], cytomegalovirus [CMV]), and polyomaviruses (BKV/JCV) in pediatric patients with inflammatory bowel disease (IBD)? Treatment with azathioprine is a risk factor for early EBV positivity in children with IBD. Hradsky O, Copova I, Zarubova K, et al. Seroprevalence of Epstein-Barr virus, cytomegalovirus, and polyomaviruses in children with inflammatory bowel disease. Dig Dis Sci. 2015 Nov;60(11):3399–407. Serum samples from pediatric IBD patients attending a single tertiary centre were tested for antibodies and viral load against the EBV, CMV, BK polyomavirus, and JC virus. Associations between a patient’s medication regimen and seropositivity were assessed. There were 106 eligible patients enrolled (CD, 72; UC, 31; Indeterminate, 3). The mean age range for all groups was 8 to 12.6 years. 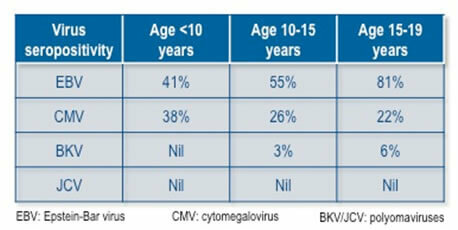 EBV seropositivity was associated with increasing age whereas CMV or BKV (perhaps because of low numbers) did not. Only azathioprine use and EBV seropositivity was significantly associated giving an odds ratio of 6.03 (95% CI: 21.16-18.75, P=0.005). Viral loads for EBV were only found in 14% of all 106 patients and none were found for the other viruses. Likelihood estimates found that early use of azathioprine monotherapy and azathioprine+infliximab to be predictive of childhood EBV seropositivity.